John R. Lott Jr. offers a piece in the New York Post on why terrorists and criminals like gun-free zones. When will politicians finally recognize that they can’t protect all the possible shooting targets? Possibly the largest mass public shooting in US history occurred early on Sunday morning, leaving 50 dead. On Friday, also in Orlando, singer Christina Grimmie was murdered after a concert. Both of these shootings had something in common: They both occurred in places where private citizens were banned from carrying permitted concealed handguns. 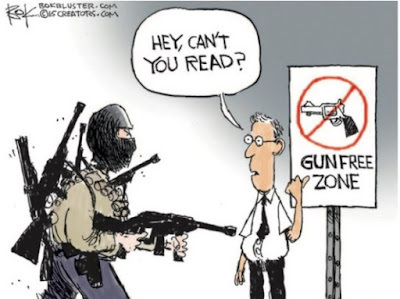 With the exception of Donald Trump, over the last few days politicians have talked about everything but gun-free zones. Hillary Clinton and President Obama have been talking background checks on the private transfers of guns or banning people who are on the “no-fly lists” from buying guns. But not one of the mass shootings since at least 2000, including Sunday’s, would’ve been stopped by these laws. Nor would renewing the federal “assault weapons” ban solve the problem; even research paid for by Bill Clinton’s administration found no evidence the ban reduced any type of crime.